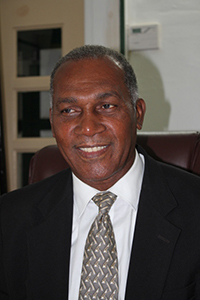 NIA CHARLESTOWN NEVIS (August 18, 2014) — Premier of Nevis and Minister of Finance on Nevis Hon. 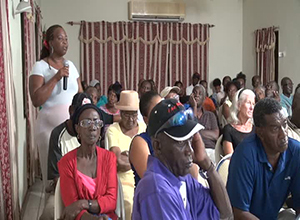 Vance Amory, underscored the importance of tourism to the island’s economy at a town hall meeting hosted by the Nevis Island Administration (NIA) at the Red Cross conference room in Charlestown on August 14, 2014. During the event, the Ministers addressed areas of growth and development on the island over the past 18 months. In his presentation, the Finance Minister explained that the Administration, under his leadership, had done a sound job of re-establishing the island’s stability and tourism was one of the key areas which had assisted. “When we look at the type of activity which is happening in Nevis, we see development projects such as the Mount Nevis project which is now on track and the developers have indicated, they will be spending some US$60million to provide an additional 32 units to add to the capacity of their existing property,” he said. Mr. Amory also listed a number of other tourism related development projects on Nevis, some of which were ongoing and others were about to commence. “We also look at the Fisherman Cabana. This is a development which will take place at Jessups near to the Mango restaurant, to provide an additional property for touristic investment. “We also have definite signs of the Hurricane Cove Development which will be converted. I think we have signed off on that and we should see some activity there shortly. [It will be] converted into a health resort which would be counted as one of the first of its kind in the Region. “We also look at the ongoing development of the Four Seasons Resort Estates (FSRE) which is adding some 60 units on the Pinneys Beach, spending some $100million to add those units and that is an ongoing project,” he said. The Minister of Finance also noted that the FSRE also planned to develop 24 villa units in the Jessups/Barnes Ghaut area, which would bring added financial benefits for Nevis. “We also have the Four Season Resort Estates development in the Jessups/Barnes Ghaut area, in which they are adding some 24 villa units which will see injected into the economy that has already commenced, some US$60million as well. “This is going to continue for the next year, maybe the next year and a half and this will see ongoing employment which will add to the level of expenditure in the economy,” he said. Notwithstanding, the Premier stated that the tourism related projects were strong indicators that the investment climate on Nevis had stabilised and that foreign investors felt comfortable to commit to investments in the economy of Nevis which would help with growth and job creation. In addition, Mr. Amory spoke to a development which had been discussed for some time. “We also look at the Paradise Palms which is a new development… We have signed off on it and this project will provide a number of high-end-villa-type touristic attractions which will see again, a significant number of investment. This will be established in the Barnes Ghaut area just above the Kawaja’s place on that site. “I think finally we are looking at the Aman Resort project and the Government has been in ongoing discussions with the principals of that project. We feel, based on our discussions with them and our assistance, we are now at a point where we are seeing the final pieces being put in place to have that project on the ground in Nevis. “We are aware that there have been some difficulties with that project but I believe, I can say with some degree of certainty, that having been in discussions and having lent our own support to the project, that we shall shortly see that project come to fruition and see some ground breaking,” he explained. The Minister of Finance also spoke of another development in the White Hall area by a local company and Administration had received firm commitment that work would commence in earnest. “We also have and have had firm commitment, for development in the White Hall area from a local company which has indicated to Government, that they will be commencing their development. “If you go past the St. James School going towards Brick Kiln, you will see on the right some initial indication of construction by the company, to herald the fact that they are serious about that development. This will be a significantly large development in that area,” he said. Meantime, Mr. Amory spoke to the refurbishment work at the Paradise Beach Resort which was rebranded, refurbished, expanded and under new ownership. “The Paradise Beach Resort, formally the Villa Paradiso, they are in the last stages of their expansion work, their refurbishment work. We have been advised by the developers, the new owners, that they will be opening their doors in October at the beginning of the new tourism high season. “I mentioned that because this is a project that was implemented under the former CCM Administration before 2006. They have undergone some changes, some change of ownership and some, I think, wonderful and significant upgrade to what the original project was. We think we shall see there, a very unique property which will have a Nevis flavour but also have some reflections of the Pacific. It will cater, based on our discussions with the new owners, to a specific clientele and they will market to that clientele…but it will be a high-end project and this is going to add to the attraction of Nevis as a tourism destination,” he said.